Last Monday night we were privileged to meet the team behind the book Lost City of the Monkey God and the soon-to-be released documentary The Curse of the Monkey God, both chronicling the astounding discovery of the mythical Honduran ’“Ciudad Blanca” (White City).” The film’s director, producers and ASR friends Bill and Laurie Benenson hosted the event at their home. Steve Elkins, the environmentalist and filmmaker who was the driving force behind the journey, spoke of the twists and turns of his 20 year-plus obsession while he and Bill Benenson detailed the use of LIDAR (radar using laser technology) which enabled them to find the hidden city under the massive jungle foliage. Journalist and Lost City of the Monkey God author Doug Preston, along with sound engineer Mark Adams and chronicler Tom Weinberg, shared tales of wading in mud, combating giant poisonous snakes, and gazing upon objects which had not been seen in 500 plus years. Several members of the team were infected with the second-most deadly tropical parasite, Leishmaniasis, requiring special and arduous treatment from The National Health Institute. Thankfully, all are on the mend. Today, the “Lost City” is under 24/7 protection from the Honduran Special Forces as the Honduran government coordinates archaeological research. Click here Oct 2015 NGM- Lost City to view The October 2015 National Geographic article reporting on the discovery. Keep your eyes peeled for the film when it comes out, and in the meantime, checkout all the other fascinating projects at Benenson Productions You’re also welcome to drop us a line info@AidStillRequired.org to be alerted when the film debuts. 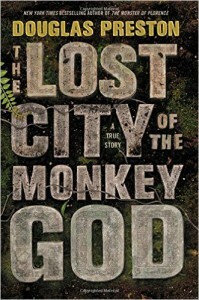 “Lost City of the Monkey Gods” is available on Amazon or through your local bookstore.